(Cohotate Preserve - 4 May 2002 - 01) Today was a beautiful sunny day, so we decided to take a walk around Cohotate Preserve for a little exercise and to see what was new. We realized that we had never taken a picture of the entry sign. On our way in, we stopped to solve this deficiency. If you have not been on one of these photo journal field trips with us, we suggest that you go on the Cohotate Preserve - 5 Sep 2001 field trip as it will show you more of the general features of Cohotate Preserve. (Cohotate Preserve - 4 May 2002 - 02) As we began our walk, the first thing that caught our eye was this small patch of what we believe to be Amanitopsis vaginata mushrooms. 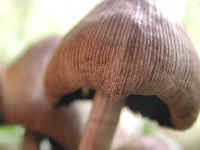 The distinguishing characteristic of this mushroom is its striated edges. (Cohotate Preserve - 4 May 2002 - 03) In this mouse eye view of this patch of Amanitopsis vaginata mushrooms, we gain a different perspective. (Cohotate Preserve - 4 May 2002 - 04) This photo gives us an even closer view of the striations on the edge of the Amanitopsis vaginata mushroom. (Cohotate Preserve - 4 May 2002 - 05) In the same area as the mushrooms we found a small patch of rare rue anemone. 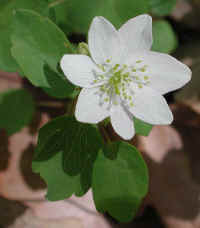 One of the interesting things about the rue anemone is that it doesn't have any petals. What look like petals are really bracts (the outer covering of the bud). (Cohotate Preserve - 4 May 2002 - 06) This is an enlarged view of the rue anemone. 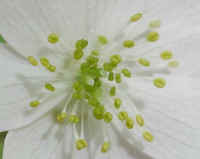 The actual size of the flower varies from 1/2 to 1 inch. This one was about 1/2 inch across. 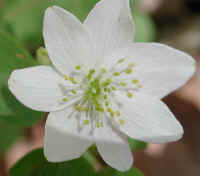 The number of petal-like bracts on the rue anemone can vary from five to ten. (Cohotate Preserve - 4 May 2002 - 07) In this even greater enlargement of the center of the rue anemone flower, we get a bee's eye view of the numerous stamens and three pistils. This enlargement also shows some of the cell structure of the petal-like bracts. (Cohotate Preserve - 4 May 2002 - 08) We always receive a double joy on these field trips to Cohotate Preserve: the joy of walking through a portion of God's creation and the joy of preparing this photo journal, for the photos often add a different dimension to what we have seen with our eyes. An example is this photo in which the rue anemone flower seems to float above the out of focus, somewhat ethereal background. 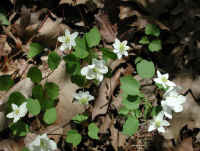 (Cohotate Preserve - 4 May 2002 - 09) At the top of the stock of each rue anemone are a whorl of leaves and flowers radiating out like spokes on a wheel. 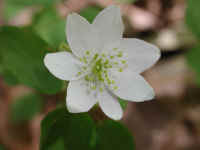 This construction causes the leaves and flowers to tremble in the slightest breeze, which was the reason that the rue anemone got its other name, "windflower". The name "anemone" is derived from the Greek word "anemose", which means wind. 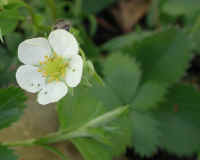 The rue anemone on the right has 6 leaves and 3 flowers. 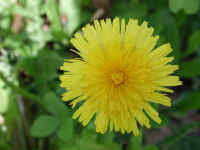 (Cohotate Preserve - 4 May 2002 - 10) As we continued along, the bright yellow flowers of the dandelions shone forth like small garden lanterns illuminating both sides of the pathway. (Cohotate Preserve - 4 May 2002 - 11) The dandelion is really quite a beautiful composite flower, which we should appreciate as any other part of God's creation. We look forward to their return each spring. (Cohotate Preserve - 4 May 2002 - 12) Wild strawberries were also growing along the entry path. 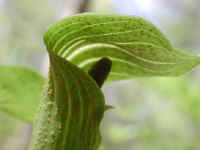 (Cohotate Preserve - 4 May 2002 - 13) As we continued along, we spotted this jack-in-the-pulpit. We have noticed that there are two different types. 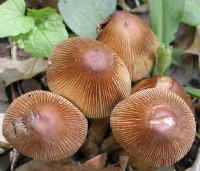 The ones with the greenish or whitish colored "jack" have a dark contracting "canopy" over the "pulpit", as this jack-in-the-pulpit has. (Cohotate Preserve - 4 May 2002 - 14) This coltsfoot is another of the wildflowers we spotted as we continued along the path. 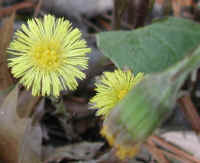 The coltsfoot is a composite flower made up of ray flowers and tiny flowers in the center, as can be seen in the left flower. 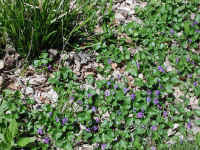 (Cohotate Preserve - 4 May 2002 - 15) We spotted some violets growing near the path. 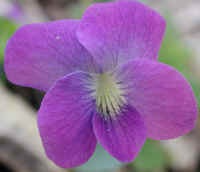 The beauty of the violet takes on a whole new meaning when viewed through the macro lens of the camera. 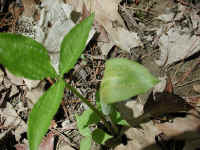 (Cohotate Preserve - 4 May 2002 - 16) We then spotted another jack-in-the-pulpit. This one had the reverse coloration of the one we had photographed earlier. Note the dark colored "jack" and lighter colored "canopy". This one also appears to have hundreds of tiny insect eggs deposited on the outer side of the petal. 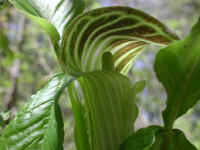 (Cohotate Preserve - 4 May 2002 - 17) This top view of the jack-in-the-pulpit shows the palmate leaf with three leaflets on a single stem growing from the ground. 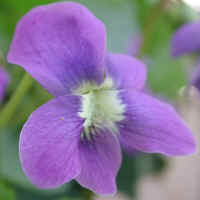 Similarly the flower grows upon a single stock arising directly from the ground. (Cohotate Preserve - 4 May 2002 - 18) We continued our walk down the path to the Hudson River, which was at or near low tide. 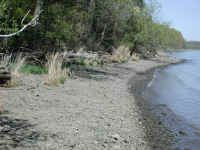 In this photo we are looking northward along the west shore. The waves created by a passing motor boat can be seen lapping on the shore. 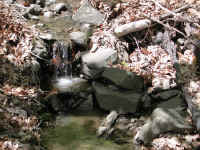 (Cohotate Preserve - 4 May 2002 - 19) As we left the River's edge and returned to the path, we walked over a foot bridge that crossed this drainage stream with its little waterfalls. 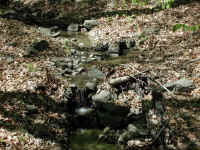 (Cohotate Preserve - 4 May 2002 - 20) This is another view of the same drainage stream. (Cohotate Preserve - 4 May 2002 - 21) As we continued our walk through Cohotate Preserve, we came upon another patch of violets. 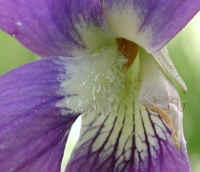 This is an enlargement of one of the flowers. (Cohotate Preserve - 4 May 2002 - 22) This is an enlargement of a damaged violet flower. The lower right petal has been torn away. However, this flower does afford us an excellent picture of the lower left petal's bearded section, which would normally be on the right petal, too. There is a sadness that part of this beautiful flower is missing, and a joy that the remaining portion still displays the wonderful beauty and detail of God's creation. We humans have systematically destroyed portions of God's creation, much in the same way that this flower has been partially destroyed. (Cohotate Preserve - 4 May 2002 - 23) This is one of the patches of violets we saw along the edge of the grassy peninsula that projects into the Hudson River. (Cohotate Preserve - 4 May 2002 - 24) We left the grassy area along the River and proceeded up the hill. In the woods to the right, we saw these flowering dogwood trees. (Cohotate Preserve - 4 May 2002 - 25) This is a portion of the man-made or enhanced pond with its new growth of cattails. Even though there is beauty here, it is not equal to that of a natural pond. Hopefully in a few more years, that "natural" beauty will develop more fully. (Cohotate Preserve - 4 May 2002 - 26) This a view of the western end of the pond where the construction scars are most evident on the sloping hillside. After taking this picture, we walked back to our car and went home to eat our vegetarian (vegan) lunch. We will return again, soon!.